The economic situation is bleak, and getting bleaker. In some sense the current economic crisis is primarily an energy crisis. The American economy rose to global hegemony on a wave of inexpensive petroleum. An assumption of perpetual cheap energy is the foundation of the business plans of nearly every corporation traded on the NYSE, NASDAQ, and other exchanges. The global economy assumes cheap oil, and no economy assumes this with greater enthusiasm than the prodigiously profligate U.S. economy, which consumes 25 percent of total annual global production of petroleum, most of which fuels the country's motor vehicles. However, the era of cheap abundant oil is over. That's the dope slap now causing panic in the equity markets. Despite the momentarily lower price of oil, the long term trend is for increasing scarcity and rising prices for petroleum. Alternative fuels on the massive scale needed to fuel the global economy are scant, unrealistic, underdeveloped, and distant at best. Welcome to post peak America. The new energy reality will have significant impacts on the economy. The first domino to fall was the housing sector, having powered economic growth for several decades through sprawling development of energy-intensive exurban "McMansion" subdivisions. The mortgage driven banking industry was the next domino to fall. Other sectors approaching collapse include consumer credit cards, mall retail, automobile makers, and the airline industry. Business is eroding for the restaurant, travel and hospitality sector. Energy-intensive and credit dependent corporate agriculture is in trouble. The fuel-guzzling military-industrial complex will be challenged. Sadly, America's political leadership fails to understand this pivotal paradigm shift, and seems determined to launch another frenzy of stimulative highway spending in a futile attempt to reinvigorate the "Happy Motoring Era." Those interested in more detailed examinations of the new energy future might consult the work of thinkers such as James Howard Kunstler, Michael Klare, and Paul Roberts , or films such as The End of Suburbia: Oil Depletion and the Collapse of the American Dream or A Crude Awakening-The Oil Crash . Eventually the American economy will reach a new equilibrium, but it will doubtless be at a lower level. This will require a fundamental shift in how we live. • Urban Rebound: sprawling suburbs will lose their appeal, as gas gets scarce and costly. Dense, walkable cities will become more attractive, making transit and bicycling more practical. • Transit Renewal: strapped public agencies will find even basic road maintenance an expensive challenge, let alone new highway construction. Fixed rail transit (trolleys), bus rapid transit (BRT), and passenger rail will all become more critical. Multimodal systems--combining bicycles and transit--will become more common. • Power-assisted Bicycles: as much as bicycle commuting purists think pedaling is a virtue, many others will look to electric bicycles, scooters, mopeds, and other energy-efficient two-wheeled transportation. We will need to negotiate better accommodation for all two-wheeled vehicles, so bike lanes are not overwhelmed with motorized transport. • Bike-Sharing: many municipal agencies will experiment with bike sharing, as a form of cost-effective public transportation. Boston, Washington, and San Francisco are among the early movers pursuing Paris Velib-style bike sharing systems. • Bike Parking: companies looking to reduce the expense of providing employee parking may become more supportive of their bicycle commuting staff. The Bicycle Commuter Act is a hopeful start; possible new initiatives to provide more equity in transportation provision will emerge. • Health Care Reform: cost-containment efforts are long overdue in American healthcare, which may shift the emphasis from medical intervention/treatment to illness prevention. This will provide more support for healthy activities such as bicycling. The shift away from an oil-intensive economy and transportation system will be traumatic and difficult. But it doesn't have to be. Much has been done in many communities around the U.S. to facilitate bicycle commuting. We need to encourage even more public investment in bicycling, and end support for gas guzzling foolishness. The future of bicycle commuting may be very bright, and may be the foundation of economic recovery. What do you think of the future prospects? Is there a silver lining for bicycling in the dismal economic trends? We can speculate about an Urban Rebound, but expect fierce resistance in the suburbs to higher housing density. As a veteran of the zoning wars, I've seen conservative activists fight to "preserve our suburban way of life." Townhouses = traffic jams & overcrowding schools. Bike/Ped trails = access routes for drug gangs & burglars. Politicians pay attention to vote counts, not facts. Don't speculate about an Urban Rebound, get together with local groups and then go to the city council and fight for it. I do like the sentiments in this post do believe that the bicycle has an important role going forward. However, the extent those in the industry and advocates believe in this utopian line of thinking always seems a little unrealistic. Much more money and attention is being poured into development of alternative fuels that are either already available or soon will be. The infrastructure in place, while in a mild state of disrepair, is still the most advanced road system in the world considering its size. More dollars are going into road infrastructure/repair than are new alternative projects by a large margin. I think the downturn in the economy definately will have a positive impact on bike commuting. With the increase in biking, hopefully we will also see a positive impact in the health of our citizens. There is definately a bright side to this whole mess. While I think that oil prices cannot remain low, this overlooks energy alternatives to oil and even oil from other sources. There is at least one company that claims to have brought solar down to a dollar a watt (not including installation). We can make oil from turkey guts Discover Magazine Last price I saw for break even was $80 a barrel (though I didn't see it in that article). When the price rises about $80 again it will be a big motivator not just for making oil, but tar sands, solar, wind, geothermal, and whatever else we come up with. If there is money to be made someone will figure it out. It maybe too late for some, but it will still happen. The world is changing as it always does, today it looks like we are close to peak oil or just past it. We'll get over it just like all the... well lets say "horse waste" that was supposed to overrun New York by now. All those horses that were used for carriages and everything else had to go somewhere. Though for now the economic realities will likely help bicycle commuting, I do not think dwelling on just economics will really help long term. Why do you bicycle commute? I started because I like it and have fun bicycling to work. Sure I'm healthier, it is far cheaper even for a short commute, I'm less stressed, and it is good for the environment. For me those are all side benefits, it is mainly about fun. Don't let just one reason dominate the discussion. To the trends above, you need to add an aging society, with the cost of senior citizens socialized, and the high levels of public debt this generation of seniors has foisted on future generations. I believe a quality public transportation system, such as that found in Europe, is off the table. The government won't be able to invest in roads OR transit. We'll be lucky if existing infrastructure doesn't continue to deteriorate. Bicycles have zero public operating costs, and low public capital costs. That makes them the way of the future, along with carpooling (more effective use of existing roads), telecommuting and walking. Yes, aging is another factor, which impacts motoring. Older people will lose the capacity to drive, but will still need mobility. Mature children won't be available to chauffeur. @Charlie: Whether suburban residents like it or not, the suburbs will decline. It's already happening as "upside-down" mortgage holders walk away from negative equity properties. See the great George Packer article in the New Yorker on Florida real estate. Expect more sprawling suburbs to begin experiencing this flight and decline. I'm also not optimistic on the development of alternative energies, especially on the scale needed to move 200 million people in single-occupant private vehicles. Not going to happen. We'll soon need existing energy sources merely to grow food (petroleum is also used for fertilizer), and motoring won't be the priority. Ha, sounds great to me! Too bad this transition period is filled with people losing their jobs and savings. I'm extremely excited by this prospect, but I'm afraid that people will be too busy clinging to what was to have the vision to create a sustainable long-term infrastructure that includes bicycle and pedestrian avenues. It's already a major issue in St. Louis-- nobody has the courage to bet on a city that experienced such a steep decline even though good bicycle and pedestrian access is often an indicator for a vibrant and increasingly affluent community. I don't know... I'm hopeful! It'll take more than talking about it on blogs, I'm afraid. Time for everyone to take action! Those involved in community planning should take some hints from European planners. Ample sidewalks and shortcuts for bikes make bike commuting easier and more attractive. If only I had some cut offs in this city-- maybe my 12 mile commute wouldn't seem so insanely dangerous and roundabout! I hope. I do not know, but maybe it will be a generational shift. Some changes occur because people gradually change their behavior. Other times people don't change, but one generation acts differently than another - think letter writing and newpapers verus the internet - facebook, blogs and so on. I think us boomers will get increasingly depressed and cranky and keep driving. But not all of us, and who knows? These kids may be very different. I hope so. Thermal depolymerization seems really cool, but Changing World Technologies filed for bankruptcy earlier this month after several years of work. Remember, almost all of that fuel we're extracting from turkey guts started out as fossil fuel in the first place. There was a lot of initial hope in the bike industry when the economy started falling, but there are now signs of stress. Almost the entire bike industry operates on imports and on credit just like any other consumer market, and the higher cost of imported good along with credit restrictions is having a serious impact on bike businesses. Several people foresaw the housing, mortgage and credit market collapse, but we're in a truly unprecedented scenario of resource contraction now. It's unfortunate that so many people still operate with their old models and assumptions and believe we'll pull out of this just like any other recession. I get people yelling at me while I'm riding. When I arrive at my destination, I get lots of attention. :) People are always asking me questions about how cost-effective bicycling is, and how I got started, how I'd suggest getting started, etc. I don't get ignored as that crazy greenie liberal (pinko communist, whatever). I've had people yelling at me while riding, stuff like "Go buy gas, freak!". The other thing that will have to change is the overall hostile attitudes bicycle riders get from the motoring public. Another change that will need to happen would be to introduce the concept of vehicular cycling, that is operating a vicycle as the driver of a vehicle. Where did you get your economics degree? Oil is not and has never been the driver of economic prosperity. Every business that operates does so on an under-capitalized basis. Without credit, no R&D takes place...without credit no business expansion takes place...without credit no accounts receivable or inventory are financed. With no credit cards almost all consumers would be forced to live within their means. The housing industry did not cause the colapse of the credit markets, it is exactly the opposite. The decline credit markets stopped housing dead in it's tracks. In a post World War II society, credit markets have been the driver of US and global expension. When the economy ebbs and flows it is because the credit markets have gotten too far in front of themselves and there needs to be a pull back. If you're going to leave your world of bikes and commuting tips...at least have some idea that what you say has a shred of truth. Actually, I do have a business degree from Bentley College (now Bentley University). And I have a sort of "graduate degree" from the James Howard Kunstler School of New Urbanism. I do stick by my original suggestion that the global economy has been fueled over the past 60 years by cheap petroleum. And the impending price increases of energy over the next decades will cause considerable stress, if not collapse, of the economy. The U.S. in particular has been especially profligate in its energy use, especially with its sprawling energy-intensive strip mall retail, suburban office park campuses, and cul-de-sac residential development. This will end painfully. The housing market was way, way overinflated; may beyond growth in personal income. Credit market shenanigans played an important part; but it wouldn't have been built as it has without the assumption that the cheap fuel suburban lifestyle could go on forever. Mr. Dorn, with all respect, you are wrong. Let's try this again. Residential Land Developers do not buy land with out credit. Residential contractors do not buy lots and build houses without credit. Consumers do not buy homes unless they can get them financed. Population growth, regional growth (sunbelt) and commodity prices tend to be the regulators of the housing market. The price of steel, lumber and sheet rock (to name but a few) all saw major market increases before the price of oil increased. The price of oil only fueled the proverbial fire after the fundamentals forced the housing market into decline. You are correct in that there was fraud in the home mortgage, but you are wrong with where it was created. It was created by congress (blue and red)during the Clinton Administration when products were developed and were crammed down the throats of mortgage bankers. For fear that Janet Reno would throw them into jail, mortgage bankers made loans as they were instructed. Congress did not consider an impending economic downturn and that people could not repay their loans...thus we have widespread panic over sub-prime mortgages. While oil does play a role in the economy, it is by no means a driver. If you will spend some time digging into how prices for the sale of crude, refinement and consumption are set, you will see that Congress has dirty little secrets that the average American will never know. Don't get me wrong...prices for oil were way too high last year. The government was testing the American public to see what the choke point was. Since the price per barrel moderated (in itself a whole different conversation), prices have stabilized and I bet oil prices will continue to stay stabilized for the foreseeable future. Knowing many developers and mortgage bankers, I can honestly say not a single one of them feels that oil had anything to do with the colapse of the housing market. Our shop experienced a rush of potential bicycle commuters when gas prices reached near five dollars a gallon. We sold a lot of bicycles and bicycle accessories during that time. Since then we have seen bicycle commuter activity drop off to near nothing as gas prices have been in the low two dollar range. 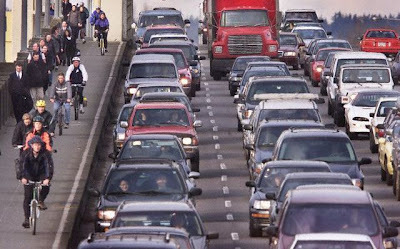 Americans will not accept cycling as transportation unless forced to by high gas prices, but even high gas prices are only effective for a short time until we become accustomed to the new price and go back to our wasteful ways. I have to agree with kind1, cycling will never be for everyone. Outside urban areas the car is the best way to get around. I don't see that going away. If you think roads are expensive, consider the costs of maintaining public transit. In NYC I think cycling can help relieve the strain on our public transportation system, but never replace it. Also, urbanites may live in cities, but an anti-car philosophy would require that their lives revolve almost entirely around urban centers--no thank you. Many commuters live outside cities and need to drive. The problem is that internal combustion engine needs reforming. I bike to work as often as weather permits. I prefer it to any other way of getting to work. I think a long-term reality for urban cycling is getting all parties to accept sharing the road--with or without bike lanes, which I am ambivalent about. commuting in cities by bike is a great way to save some pennies especially vs car. we have a bike hire scheme in brisbane however it has been a total flop due to mandatory requirement of helmets. it would have been a great idea otherwise. Dutch bicycles finding a market in U.S.? Paul Dorn is a writer, activist, creator of a popular bike commuting site, and co-author (with Roni Sarig) of The Bike to Work Guide: What You Need to Know to Save Gas, Go Green, Get Fit (Adams Media, 2009). He is the former editor of the Tube Times, newsletter of the San Francisco Bicycle Coalition (SFBC), and served on the SFBC board of directors. He is the former executive director of the California Bicycle Coalition. Dorn is certified by the League of American Bicyclists as a League Cycling Instructor (#1237).